The Arc Wisconsin and disability advocates from across the state gathered at the State Capitol on Wednesday, March 28, to witness as Governor Walker signs a landmark Employment First bill into law. As one of the state’s most prominent voices in protecting the rights of people with intellectual and developmental disabilities (I/DD) in Wisconsin, The Arc Wisconsin has been a leading force behind this bill that will ensure more people with disabilities are employed in Competitive Integrated Employment (employment in the community at typical wages). The current community-based employment rates for people with disabilities in Wisconsin are critically low. According to a survey published in 2017, only 15% of individuals with (I/DD) have a paid job in the community, while many individuals are either unemployed or work in sheltered or facility-based environments. This lack of community-based employment opportunities is contrasted by individuals’ desire to work in community-based and competitive jobs: of the individuals who were not employed in community-based settings, 41% reported a strong desire to work in the community. Among the many proposed changes delineated in the bill is the requirement for state agencies (DPI, DHS, DVR) to set Competitive Integrated Employment (CIE) as their priority policy while protecting an individual’s choice of allowable facility-based employment services or sheltered work. The bill also requires that state agencies collaborate to develop a joint plan to improve rates of CIE and establish evaluation methods to ensure that the proposed measures are effective in promoting CIE across the state. The passage of the Employment First bill was part of concerted effort by a state-wide coalition of disability rights groups to pass three crucial bills that safeguard fundamental rights and promote greater independence of people with I/DD in the state. The bill was introduced by a bi-partisan group of state policmakers, including State Representatives James Edming (R) and Jimmy Anderson (D) and Senator Thomas Tiffany (R). It passed by unanimous voice vote in both legislative chambers. 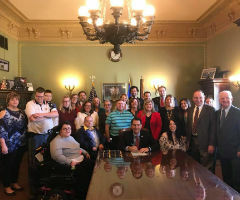 Many state disability rights groups joined The Arc Wisconsin in championing the bill, including Disability Rights Wisconsin; Wisconsin Board for People with Developmental Disabilities; Special Olympics Wisconsin; Goodwill Industries of Southeastern Wisconsin and many others. Content take from: The Arc Wisconsin stands with People with Disabilities to Witness Wisconsin History: Signing of State’s Employment First bill into Law. The Arc Wisconsin. March 27 2018.